Economic freedom in the 21st Century – for the average American – will increasingly mean safe, efficient access to jobs, schools, and all the ele- ments of the good life avail- able in the American city. A shift – accelerated by actions in Houston, of all places – is happening in how transit is un- derstood and optimized. Hous- ton Metro’s redesign focused on providing frequency rather than coverage. “Frequency equals freedom” is the mantra and the goal is actually improving the lives of as many people as possible. This revolution in transit ser- vice contains many ironies and seeming contradictions. Houston has proven people can have better transit service with the same budget. Fre-quency means efficiency inpublic spending. It is simply a matter of doing a better job with what is available to provide more people with more. Planning a transit system that connects the entire city by prioritizing people – including low income people – gives them access to our most valuable asset: other people. Cutting under-performing routes – eliminating the bus that some people may have depended on their entire lives – can be the socially equitable thing to do. The question is how many people – including our actual neighbors living in poverty – can we serve with great transit service that really provides full access to all of the city? 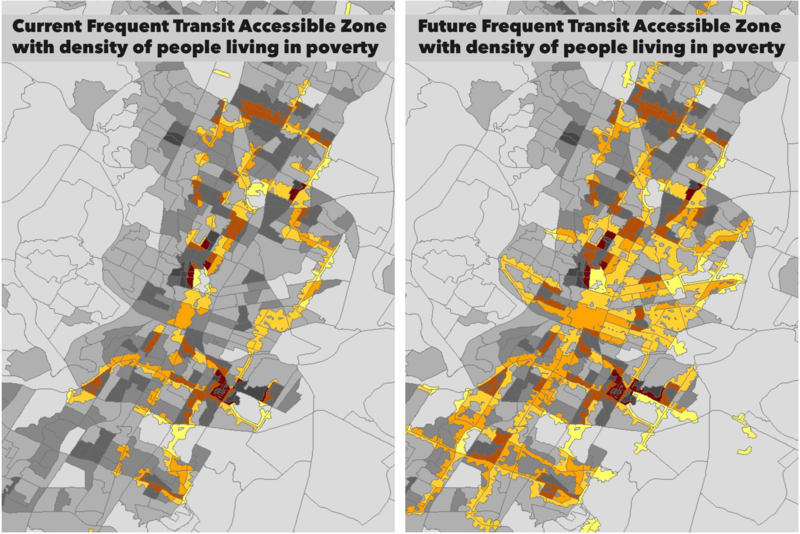 We found Connections 2025 would provide many more households living in poverty better access to frequent transit than today, as shown in the numbers to the right. The expansion is dramatic, giving 32,000 more households access to frequent transit, including almost doubling the amount of households living in poverty within walking distance of frequent transit stations. There are other key questions for Connections 2025, especially whether changes in access to non–frequent bus stops have negative consequences to people living in poverty thatoutweigh the benefits of access to a frequent grid network. Further questions to help optimize Connections 2025 and transit in Austin – which we would love to have the time and funding to study – are suggested at the end of the report.